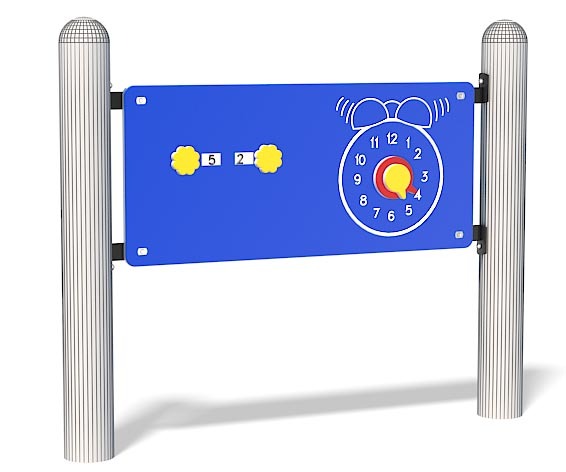 A smaller version of our clock panel, complete with moving hands and an adjustable digital-style clock. Mini Clock Panel is a mechanical assembly of panel brackets and panel. Panel brackets are a welded assembly of 0.1875” x 1.75” (5mm x 44mm) zinc-plated hot-rolled mild flat steel. Panel brackets are powder-coat painted. Panel is 0.75” (19mm) bi-color sheet polyethylene.